While cities are developing faster than ever and technology is increasingly an integral part of the urban environment, the two trends fail to meet the need for sustainable urban development. As the field of XR technologies is rapidly growing, the potential to connect the technologies to sustainability science and visionary planning for sustainable cities is new, huge – and still largely unexplored. Welcome to XR developers’ workshop, XRnight, which aims to gather brilliant minds primarily of XR creators and UX experts in an after work-style creative brainstorming session focused explicitly on the nexus of sustainability, cities, and XR. This is the first workshop, intended to guide forthcoming workshops during the running time of the project. You do not need to be an expert on cities or sustainability: your XR and/or UX expertise, along with creative thinking is what is important. What’s in it for me (except for a great way of spending an autumn Tuesday evening)? 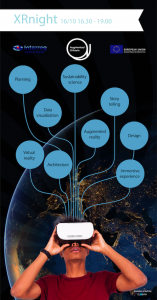 Through the workshop you’ll be part of a team of early explorers on how XR technology can be merged with sustainability science; and on new XR application areas in urban development. The event also offers the chance to form new key contacts and to gain new inspiration for your own work. Oh, and there will be refreshments. We organize it all, you just show up as your most creative and passionate you! Interested to join, want to know more? Please send a message to our XRnight organiser, Maria Schewenius (maria . schewenius [at] su . se) to learn more!